The studios accommodate two guests with a balcony overlooking the gardens and pool. Paradise Links Resort also offers one and two bedroom apartments with kitchenette, sitting and dining areas. 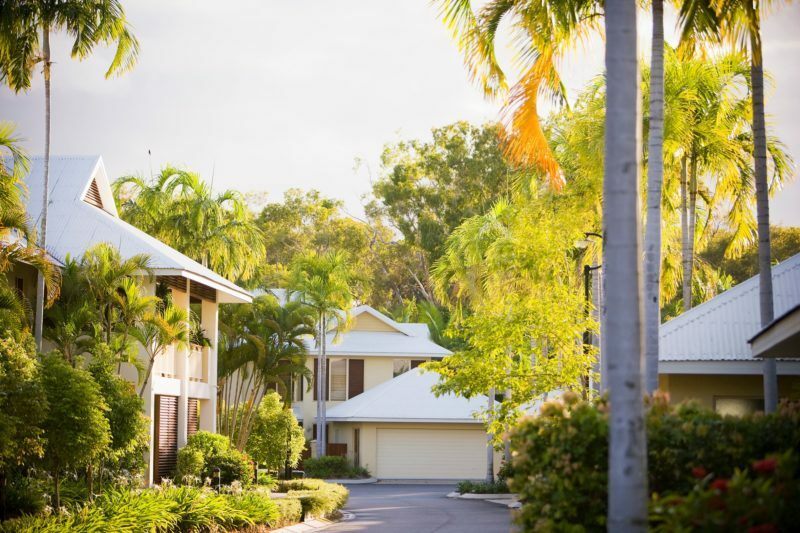 The two, three and four bedroom Villas accommodate up to nine guests, are two storey and offer spectacular views over the golf course or tropical rainforest. 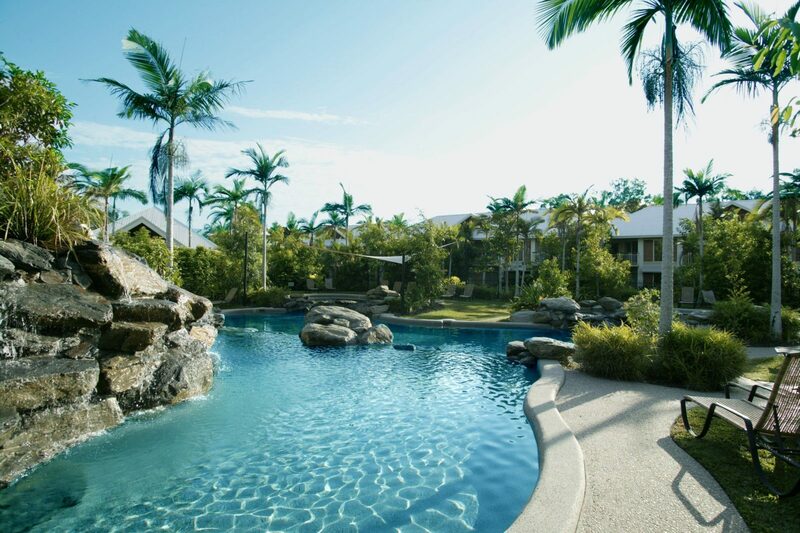 Paradise Links Resort features two lagoon style swimming pools, tennis court, basketball hoop, two separate barbecue areas, free WiFi, complimentary car parking, bike hire and tour desk. 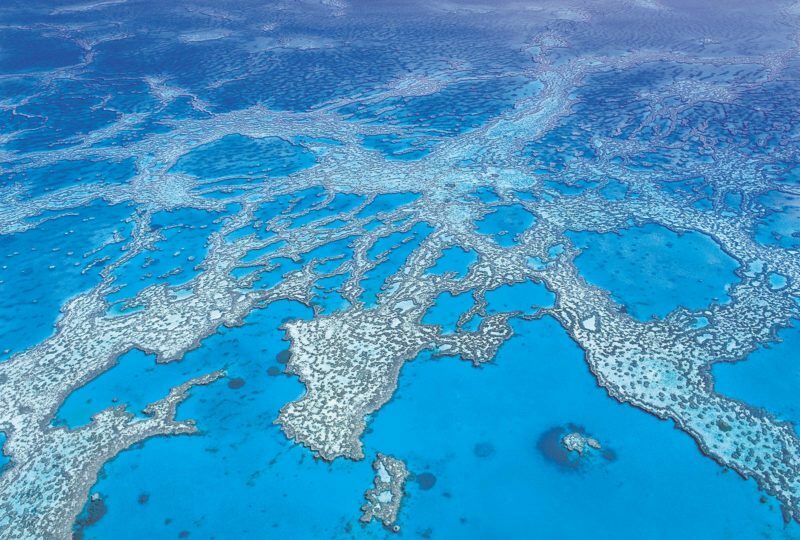 From Paradise Links Resort you have easy access to snorkelling the Great Barrier Reef, touring the Daintree Rainforest, or spend the day shopping or relaxing. Two Bedroom Villa views include spectacular green fairways and lush tropical gardens. Available with king and two single beds. Features full kitchen, lounge and dining area, two bathrooms, hair dryer, downstairs powder room, laundry with washing machine and clothes dryer, iron and iron board, air conditioning and ceiling fans, private balcony area, television, DVD and Austar. Rooms serviced weekly for booking of eight nights or more. 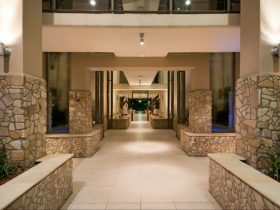 Views include spectacular green fairways and lush tropical gardens. Available with king, queen and two single beds. Features full kitchen, lounge and dining area, two bathrooms and a downstairs powder room, laundry including washing machine and dryer, iron and iron boarding, air-conditioning and ceiling fans, private balcony area, television, DVD and Austar. Rooms serviced weekly for booking of eight nights or more. A studio room with views overlooking lush tropical gardens and the lagoon style swimming pool. Available with a king or twin beds. Separate bath, shower and own balcony area. Features include air-conditioning and ceiling fans, television, DVD and Foxtel, tea and coffee making facilities, fridge, iron and ironing board, hairdryer. Room serviced after five days. Please note there are no cooking facilities. Four Bedroom Villa views include spectacular green fairways and lush tropical gardens. Available with king, two queen and two single beds. 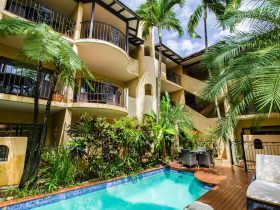 Features full kitchen, lounge, dining area, three bathrooms and a downstairs powder room, laundry with washing machine and clothes dryer, iron and ironing board, air-conditioning and ceiling fans, private balcony area, television, DVD and Foxtel. Rooms serviced weekly for booking of eight nights or more. One Bedroom Apartment views include luch tropical gardens and the lagoon style swimming pool. Available with a queen bed. Full kitchen, microwave and convection oven and gas top, lounge dining area, separate bathroom, shower, toilet, washing machine and dryer. 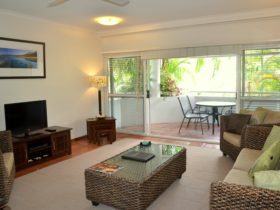 Air-conditioning and ceiling fans, balcony, DVD and Foxtel, iron and iron board and hairdryer. Rooms serviced weekly for booking of eight nights or more. 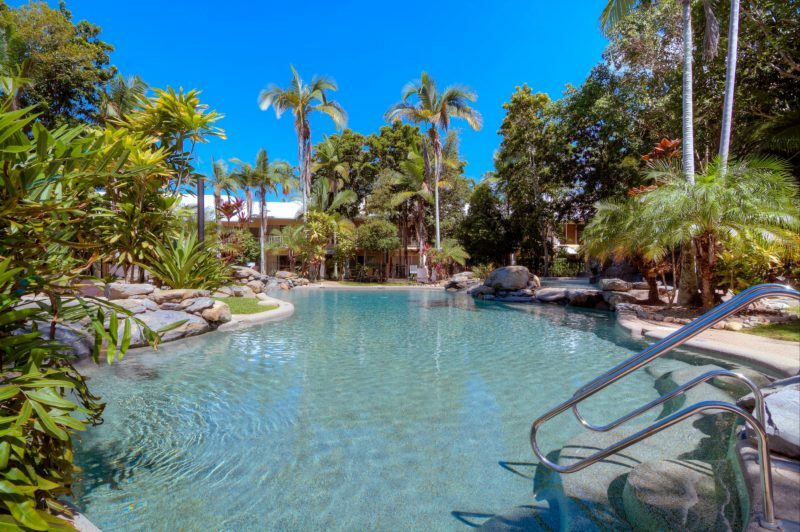 Two Bedroom Apartment views inlcude lush tropical gardens and the lagoon style swimming pool. Available with one queen bed and one king or one queen and two single beds. Full kitchen, microwave convection oven and gas top, separate bathrooms, hairdryer and own balconies. Washing machine and dryer, iron and ironing board. Air-conditioning and ceiling fans, television, DVD and Austar. This room is an interconnecting dual key suite. Rooms serviced weekly for booking of eight nights or more. 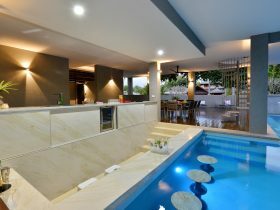 Villa Paradise is a stunning four bedroom, two storey Villa with its very own swimming pool. 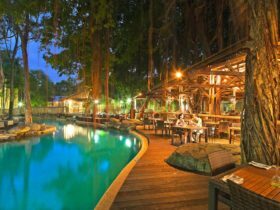 It offers stylish Asian inspired accommodation with spectacular views over the fourth tee in a lovely tropical garden setting. It features full kitchen, lounge, and dining areas and laundry facilities. Downstairs is a master bedroom with ensuite and upstairs is a second master suite with walk-through robe and ensuite with spa as well as two separate bedrooms and another bathroom. Studio Rooms to Luxury Four Bedroom Villas with private pool and barbecue.